After browsing our website, you may be inspired to come for a visit. 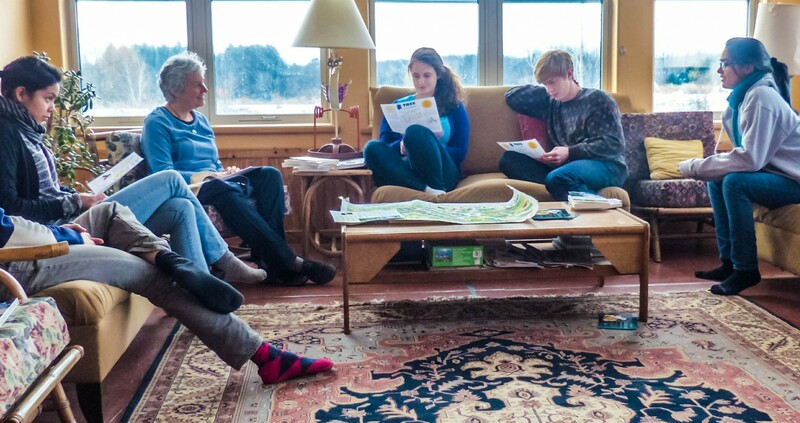 Short tours, overnight stays, and on-site learning experiences are great ways to learn more about intentional community, green building, sustainable lifestyles and the story of EcoVillage Ithaca. Over 1,000 people visit us each year. We offer hospitality and learning experiences for a few hours, days, or even months to Students of all ages, Educators, Cohousing folk, Media, Researchers, Professionals, Tourists, Foodies and Farmers, and the friends and family of residents. Free Public Tour departs from the FROG Common House the last Saturday of each month at 3pm. This 1.5 hour walk-through provides a brief overview of our land, buildings, lifestyle and educational mission. No need to register – just show up! Please note: These tours are limited to individual and household groups of up to 5 people. Larger groups should make special arrangements for a Private Tour with the Educational Visit Coordinator at Please note: These tours are limited to individual and household groups of up to 5 people. Larger groups should make special arrangements for a Private Tour with the Educational Visit Coordinator. Individual (Overview) and Group Tours (both Overview and In-Depth), can be scheduled for a fee. In-Depth tours can be focused on topics of interest, such as Green Building, Community Life, Farming and more. More about Tours. Village events , educational workshops, and hands-on work projects enrich the experience. Learn more about these options when you Plan your visit. Guest Rooms. We have a few guest room accommodations which may access to kitchen facilities. Our Educational Visit Coordinator can provide details. 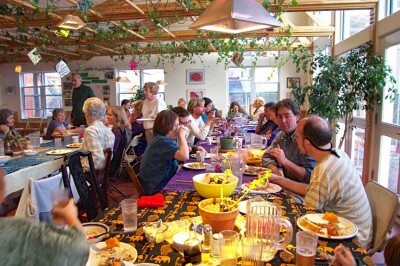 Community Dinners. 3 – 4 weekly meals (Sun.,Mon, Wed, Thurs) in the common houses provide delicious sustenance to our community, and are open to visitors with advance booking through the Visit Coordinator. During July and August, community meals days may vary. We are happy to host your visit. Please tell us about your needs and interests by contacting our Educational Visit Coordinator.